I love guacamole so much. I treasure the creaminess of avocados more than ever now that I’m vegan. Guacamole has practically become a food group!! My guacamole is special because I roast the garlic in smokey spices before adding it to the other fresh ingredients, so the flavor is all together different than raw garlic– it won’t make your eyes water! 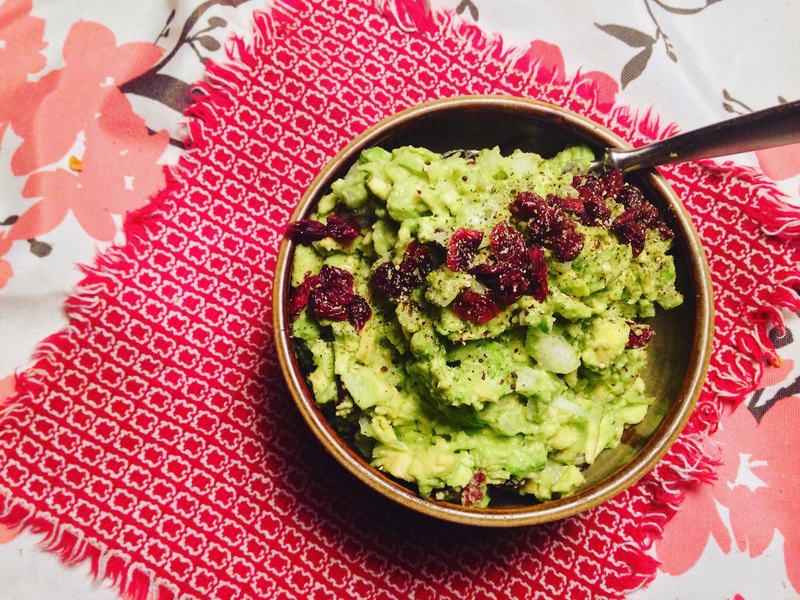 The addition of the dried cranberries give the guacamole a hint of sweetness to balance out the smokiness. Yield: Big ol bowl of guacamole! First, peel and mince the garlic. In a small non-stick skillet on high heat, add the olive oil and a couple dashes of cumin and chili powder. You can adjust the amount depending on how smokey you want the flavor! Throw the garlic in there and let it sizzle. When it becomes fragrant, only keep it on the heat for another 30 seconds stirring and flipping constantly. The garlic should never get brown or crispy. Immediately remove from heat and place in a medium sized bowl. Next, mince the purple onion and add it to the bowl. De-seed the jalapeno (or leave the seeds in for an extra kick! ), mince, and add to the bowl. Halve the avocado, take out the seed, and cube while still in the peel. Scoop out and mash together with everything else in the bowl. Squeeze the lime in, add salt and pepper to taste, and a handful of dried cranberries. Serve with chips and top with additional cranberries and cracked pepper. MmMmmMmMmmmM! !